What is the best way to determine if a provider is competent? This question is increasingly being asked by employers, regulators, certifying agencies, insurance companies, and professional associations. Currently in the majority of jurisdictions and courts, a practitioner is determined to be competent when initially licensed, able to show proof of skills competencies, and has the approval of medical oversight; thereafter unless proven otherwise, the issue of competency has been through this pathway, yet in the past decade, legal actions and media investigations have thrown a poor light on this pathway. As a result, the simple fiscal impacts to the major carriers has resulted in a standard determination that the standard must change. Many organizations and regulatory authorities are exploring alternative approaches to assure continuing competence in today’s environment where technology and practice are continually changing, new health care systems are evolving and consumers are pressing for providers who are competent, both privately, through legal action, and through social media processes. The purpose of this discussion is to explore various approaches and views related to continuing competency and examine the difficult policy, development and implementation issues related to continuing competency. Both the American Medical Association (AMA) and the American Nurses Association (ANA) have been asked this question by their membership, regulators, consumers and the public. Since competence of the provider has become a primary concern of the profession, Both the AMA and ANA have embarked on the development of policy addressing the continuing competence of practicing providers. The medical director (or their designee) will determine the means by which each emergency physician will maintain competence and skills and the mechanism by which the proficiency of each physician will be monitored. Mechanisms for continuing competence include regulatory and private sector approaches, as well as approaches by national organizations, certifying entities, and state boards. Health care practitioners are regulated by state regulatory boards with the purpose of protecting the health, safety and welfare of the public. When a practitioner is initially licensed, they are deemed by the state to have met minimal competency standards. The challenge of licensure boards is to assure practitioners are competent throughout their practice career not just with initial licensure. As well as address the issues of post licensure inexperience during the first licensure period. The ongoing demonstration of continuing competence is not a new regulatory issue. According to a national commission on health manpower sponsored by the U.S. Department of Health, Education and Welfare recommended physicians undergo periodic reexaminations(Schmitt provider, competence, 1996). In 1971, a similar report recommended that requirements to ensure continued competence should be developed by professional associations and states. The alternative to periodic reexamination was deemed to be continuing education (CE) and states began requiring mandatory CE as a condition of licensure renewal for a variety of professions. 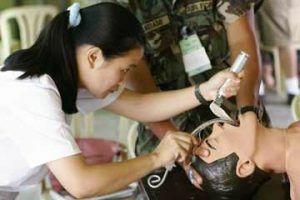 The National Registry of Emergency Medical Technicians (NREMT) required both continuing medical education and skills competency evaluation in its very first year of establishment. This approach to continuing competence proved to be controversial. Given the broad parameters of what continuing education consists of and the lack of formal research to support the correlation between participation in continuing education and continuing competence related to improved practice outcomes, this method has been called into question. However, several investigators are working to make this link by designing a longitudinal descriptive research study to determine the relationship between education sessions and practice. The 2006 study, National Reregistration and the Continuing Competence of Paramedics, by Keith Holtermann and colleagues, found that NREMT Paramedics who reregistered 4 and 6 years after initial registration were twice as likely to pass the exam as their State-certified cohort counterparts who did not reregister with the NREMT. The registered group, compared to the nonregistered group, had significantly more Continuing Medical Education. The findings suggest that Paramedics who reregister with the NREMT are more knowledgeable than those who do not reregister. In a 2011 study (The Association Between Emergency Medical Services Field Performance Assessed by High-fidelity Simulation and the Cognitive Knowledge of Practicing Paramedics; Jonathan R. Studnek PhD, NREMT-P, Antonio R. Fernandez PhD, NREMT-P, Brian Shimberg NREMT-P, et Al), investigators simultaneously assessed cognitive knowledge and simulated field performance. Utilization of these measurement techniques allowed for the assessment and comparison of field performance and cognitive knowledge. Results demonstrated an association between a practicing paramedic’s performance on a cognitive examination and field performance, assessed by a simulated EMS response. In the past twenty years, state legislative action related to continuing competency has increased. In 1999, legislation was passed in Tennessee requiring the development of continuing competence requirements of providers. In the same year, legislation was passed in Vermont mandating continuing competency evaluations of physicians, chiropractors, and podiatrists. Currently, twenty-four states have introduced legislation relative to continuing competence of health professions. Most legislation would require licensees to demonstrate continuing competence to a licensure board upon re-licensure while some bills would require a provider to demonstrate competency in the workplace setting. A bill in Massachusetts that would authorize the Board of Registration (Board of Nursing) to require periodic competency testing of all licensed and registered nursing including testing of current nursing practice and procedures. Failure to pass this test would result in automatic suspension of a nurses’ license until competency was established. A bill introduced in Hawaii would require nurses in hospitals to demonstrate competence in providing care in order to be assigned to a nursing unit. Other continuing competence bills apply to chiropractors, podiatrists, dentists, dietitians, physicians, paramedics, pharmacists and speech-language pathologists. As states regulate advanced practice, they are turning to certification as an indicator of entry-level competence. Certification in these instances is therefore not a voluntary process, but instead constitutes a regulatory requirement to ensure public safety and enhance public health. As a result, certifying bodies are expected to demonstrate that their initial certification exams truly reflect entry level and that their recertification process reflects continuing competence. The underlying assumptions regarding the use of certification to ensure competence and its inherent value have been increasingly questioned since the late 1970’s. There is a dearth of empirical data which substantiate the predictive power of certification and recertification exams, which has led to the assertion that certification does not have an impact on patient outcomes. The Joint Commission of Accreditation of Healthcare Organizations (JCAHO) requires hospitals to assess the competency of employees when hired and then regularly throughout employment. The competence assessment is defined as “the systematic collection of practitioner-specific data to determine an individual’s capability to perform up to defined expectations.” (Joint Commission on Accreditation of Healthcare Organizations, 1998). Pew Commission Reports on health professions licensure issues have been a catalyst in bringing the issue of continued competence to the public’s attention. In its 1995 report, Reforming Health Care Workforce Regulation: Policy Considerations for the 21st Century, one of the proposed recommendations is: “States should require each board to develop, implement and evaluate continuing competency requirements to assure the continuing competence of regulated health care professionals.” Accompanying the recommendation was a series of policy options. In formal responses to the report from the public, this recommendation received the highest score for level of concern and one of the highest scores for level of support. There were 76 formal responses to the report; 45% were from the nursing community which included state and national organizations as well as nursing boards; 26% of the responses were from individuals; and 29% from other health care professions including occupational therapy, physical therapy, medicine, pharmacy and dentistry (Gragnola, Stone, 1997). Identified barriers to reform included the complexity of the health care environment and the vast differences in practice. These differences make testing for competence difficult as areas of expertise may not fit into standardized testing. A second Pew Report, Strengthening Consumer Protection: Priorities for Health Care Workforce Regulation was released in October of 1998. One of the three priority issues included in the report was continuing competence. The report recommended that state regulatory boards should be held responsible to require health care practitioners to demonstrate competence throughout their careers. However, the report added that the “actual assessment of competence may best be left to the professional associations, private testing companies and specialty boards” (Pew Health Professions Commission, 1998). The Interprofessional Workgroup on Health Professions Regulation, which represents 17 health professions, received a Pew Foundation grant to sponsor a continuing competence Summit entitled, “Assessing the Issues, Methods and Realities for Health Care Professions,” July 25 – 26, 1997 in Chicago, Illinois. The objective of the Summit was for participants to recognize the significance of ensuring continued competence for health care professionals. The Summit focused on analyzing the issues related to continuing competence and promoted discussion of various methods of assessing continuing competence. Other measures to promote competence have been indirectly aimed at the prevention of potential problems through accreditation of educational institutions, background checks on licensees and the threat of disciplinary action if the licensee is reported to the board. Whose role is it to assure continuing competence? Is it the role of the individual provider, professional association, employer, regulatory board, or certifying agency to assure continued competence? Should all of the stakeholders be involved, or just one or two? Dennis Wentz, American Medical Association, points out that 90% of physicians take specialty board examinations and pass. There are continuing medical education requirements for recertification. Fourteen programs are now operational and moving toward maintenance of competence rather than testing at intervals. The purpose of ensuring continuing competence is the protection of the public and advancement of the profession through the professional development of providers. The public has a right to expect competence throughout provider’s careers. Any process of competency assurance must be shaped and guided by the profession of the provider. Assurance of continuing competence is the shared responsibility of the profession, regulatory bodies, organizations/workplaces and individual providers. Providers are individually responsible for maintaining continuing competence. The employer’s responsibility is to provide an environment conducive to competent practice. Continuing competence is definable, measurable and can be evaluated. Competence is considered in the context of level of expertise, responsibility, and domains of practice. Building on existing regulatory models and the mission of its organizations, the National Council of State Boards of Nursing (NCSBN) has explored various approaches to determine continued competence. NCSBN has investigated the use of computer simulated testing (CST) for assessing nursing competence, reviewed and utilized mandated continuing education, and is now focusing on the licensee’s responsibility for individual competence. NCSBN has also explored through the Continuing Competence Accountability Profile (CCAP), a self-assessment tool, which “provides a framework for nurses to track and document a synthesis of professional growth activities across a nurse’s career.” NCSBN recognizes that continued competence is a multifaceted issue that compels the profession, consumers and other to assist in comprehensive development of options to best assure ongoing nursing education and skill levels. (National Council of State Boards of Nursing, 1998). In addition to competency assessment, the issue of clinical privileges is significant. In its Guidelines for Credentialing and Delineation of Clinical Privileges in Emergency Medicine, the American College of Emergency Physicians (ACEP) states the medical director (or designee) is responsible for setting competence criteria. The medical director is also ultimately responsible for determining the competence of individual department members. The medical director must also be in compliance with established department proficiency and competence criteria. In the event of question or dispute over the medical director’s competency, the matter may be referred to the medical staff’s credentials committee or to the medical executive committee. Establishing criteria for proficiency and the evaluation of proficiency may be problematic. For those medical specialties that perform major procedures (i.e. : surgery, emergency medicine, etc..), establishing numerical thresholds may be a valid methodology (ie, requiring that a minimal number of procedures be performed during the privileging period under review). Lack of numerical compliance requires stress inoculation simulation performance appraisal. However, for those specialties that are primarily “cognitive” in nature, which employ a wide armamentarium of “minor” procedural skills, establishing numerical thresholds for numerous procedures may be very difficult to track. Further, it is not clear whether such tracking of “minor” procedural skills is a valid component of proficiency assessment. Many departments will choose to establish clinical privileges assessment methodologies that utilize a combination of procedure tracking (frequency), plus assessment based on sentinel events, training, assessment, and information forthcoming from the department’s overall quality improvement plan. Establishing frequency thresholds in emergency medicine may be problematic. Certain procedures may be performed very rarely (eg, cricothyrotomy). Yet, all emergency physicians must be capable of performing this and several other rarely-performed emergency procedures. In the event that a member does not meet or exceed numerical thresholds for procedures when such thresholds have been set, an option is to extend a providers procedure privileges through a “skills lab” (eg, educational review, demonstration, simulation and testing) is a recommended process. In their work, Defining and Assessing Professional Competence, Epstein and Hundert (JAMA 2002;287(2):226-235) stated that in addition to assessments of basic skills, new formats that assess clinical reasoning, expert judgment, management of ambiguity, professionalism, time management, learning strategies, and teamwork promise a multidimensional assessment while maintaining adequate reliability and validity. Institutional support, reflection, and mentoring must accompany the development of assessment programs. Clinical competency, defined as, “The capability to perform acceptably those duties directly related to patient care. competence in professional activities directly related to patient care”, has been an issue for decades in healthcare. As early as 1967, a national commission on health manpower sponsored by the U.S. Department of Health, Education and Welfare recommended licensed physicians be re-examined periodically; this commission later recommended CE as an alternative to re-licensure. State legislatures continue to address continuing competence, as do the courts and private accreditation and certification agencies. The reality of critical care medicine, especially as applied in the prehospital environment, requires that each and every provider have base licensure, recognized educational processes, regular competency assessment, and a formal process for clinical privilege granting. Failure to have a defendable program that does not include skills demonstration, simulation, and supervised clinical practice as components of the process will not lead to improved patient outcomes, and most certainly will lead to professional or legal complications.